Hello everyone from Cusco, Peru! We're so grateful to be able to go on this trip, and by God's grace, Clement was well enough to go. Woohoo! Here's also another post that just talks about C's progress thus far. So why Peru? Well, way back in May, we were thinking of where to go in the fall. I literally typed on Skyscanner, Vancouver to "Anywhere" and put our dates on, and Peru was one of them! Coincidentally, I had been seeing a lot of Peru cheap flights from the YVR deals page, so I told C let's do it! I think C wasn't really thinking when he said yes, but anyway, we booked it! And what we didn't expect was to fall in love so quickly with this beautiful country! While we do love to explore new places, some places like Japan are just our comfort zone. Doing something out of the norm was just out of the question, but... it is something we can now do more often, yay! But I guess, what people don't tell you on travel blogs, is that getting there is just kind of meh. Haha! It does make for fun stories! To get to Cusco, we flew to Mexico city which is 5.5 hours, and then Mexico to Lima is around 6 hours. At Mexico we had to go through customs, pick up our luggage and go through security again. The line at customs was so long! Then, we discovered C's luggage was damaged in transit so we had to buy a new bag and transfer his new luggage over. We left home at 4:30AM, and we arrived in Lima at midnight. Slept for a few hours and headed to the airport at 430AM because our flight was at 6 to go to Cusco, which thankfully is just an hour away. Cool fact - a lot of our hotels had crazy early breakfast times, like 4AM - 10AM! Maybe because they know that most travellers end up having early itineraries like ours. 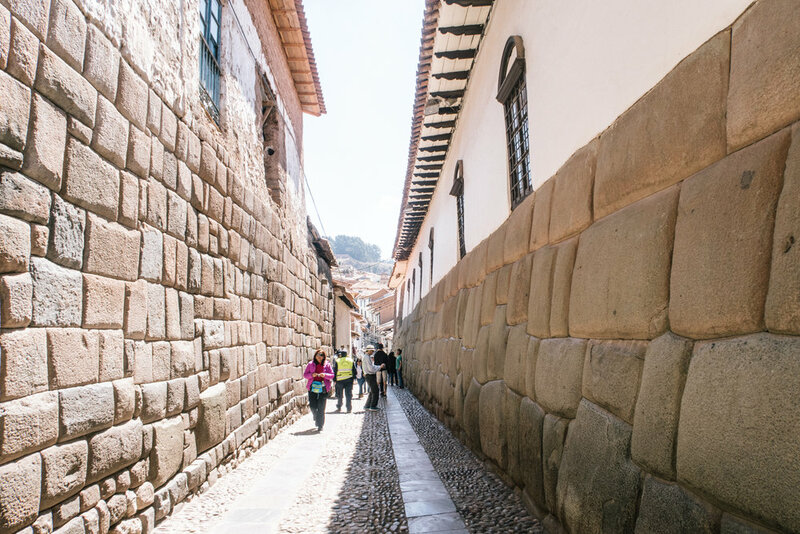 And finally, we arrived in sunny Cusco. Just from the airplane alone it was so stunning. All the terracotta-tiled roofs and tall, reddish mountains, we were amazed. Our guide, Yure from Peru Trek 4 Good, picked us up! I found him through another travel blog and really wanted a tour this time around, since it's such a historic city. Normally, I can't stand large tours, but this was a private tour and it's just us! #antisocial I just really appreciate having our own pace. After leaving our luggage at the hotel, C and I went exploring around the Plaza de Armas, which is the main square. Isn't it beautiful?! There were so many little side streets that had so much character. A lot of Spanish / colonial influence, but along the side streets had a mix of Incan + Spanish altogether, too. Almost every little town has a plaza like this too, which is so nice, to see people gather altogether and hang out. Great for people watching. Lots of restaurants around the area, too. C & I just loved seeing all this, it was just so cool to walk in such a different place. Sorry (not sorry), there's going to be a lot of photos! We were hungry so we stopped at Barrio Ceviche for lunch, and their ceviche was probably the best we had the entire trip. Super recommended! We quickly discovered that ceviche here was cut in large pieces, kind of like poke, and is served with lots of their local vegetables (which are soooo delicious) and is a huge portion that's great for lunch! Now, you would never had thought a STONE could be a National Heritage! But this special rock did. We discovered that Incans were the BEST stone masons in the Americas and this was our first taste of it. No mortar was used and they somehow managed to cut and sand stones to utter smoothness and into shapes that snugly fit into each other that they've withstood the strong earthquakes in this area. Absolutely loved wandering around the various streets in the area. Those roads!! They're terrible for cars though, C's heart was breaking. Haha! In our wanders we also visited the Incan Museum, which was super cool! Of course they didn't allow photos, but it was so amazing to see their pottery and handiwork that has stood the test of time. 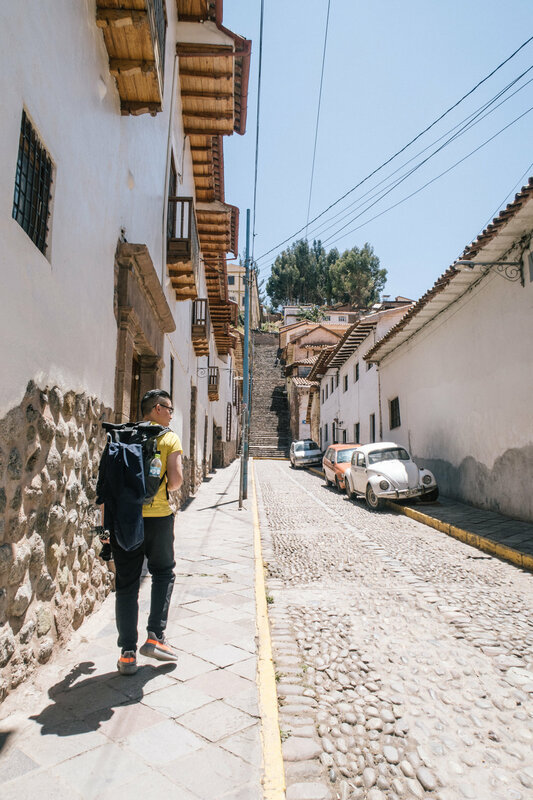 In our wanderings, we stumbled upon the San Blas area, which is kind of their artisan quarter with lots of small handmade shops and interesting cafe's. Such a beautiful neighborhood! 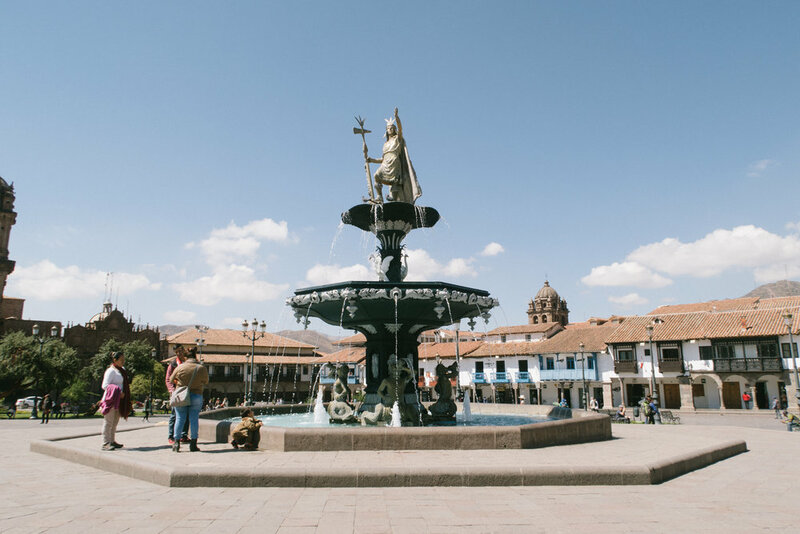 It had a plaza with a fountain that resembled falls to me, so we sat down and watched people walk by, to the sound of chirping birds and rushing water. We were both trigger happy to say the least. More like C was video-happy and I was trigger happy. We make a good combo, don't you think? The last pic with the garden... I just wanted to enter that place so bad! Haha. 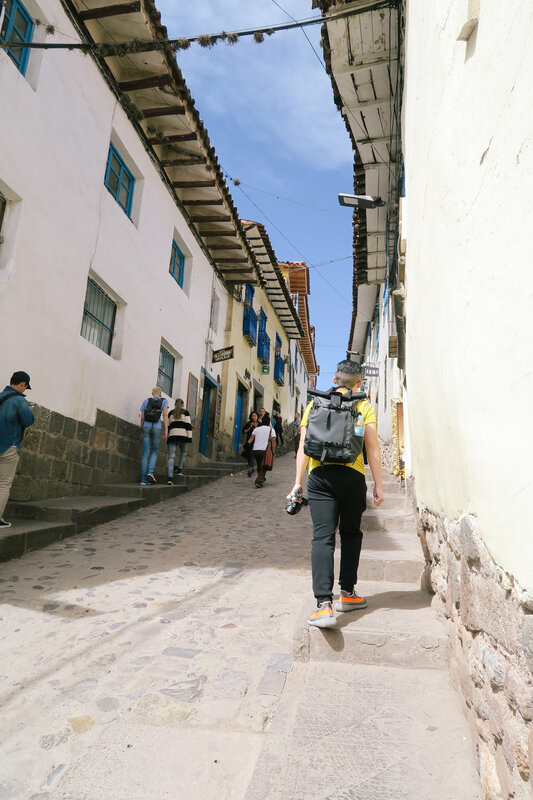 We "took it easy" on our first day because we had heard so many stories of altitude sickness in Cusco, as it's around 3400m above sea level. We've been to higher altitudes before without problems but we just wanted to make sure, so we did take Diamox and of course there's coca tea at the hotel, too. But, with all our walking we still ended up with over 25,000 steps that day, LOL! It was so nice to just wander about without having a real itinerary for that day though. Ended our day with some delicious pizza and called it a night! There's going to be lots of photos on this trip so we'll be sure to post more of the other days in our trip!